Movement is vital for every animal. It strengthens muscles, increases range of motion, and moves important fluids in the body among a few benefits. But at times, movement on land is restricted due to injury, surgery, or age. Swim therapy offers non-weight bearing exercise allowing your dog to move in a low impact environment. 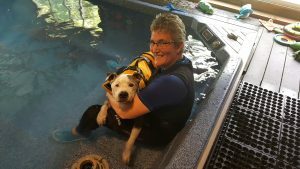 Even dogs who can no longer walk, benefit greatly from being in the pool. 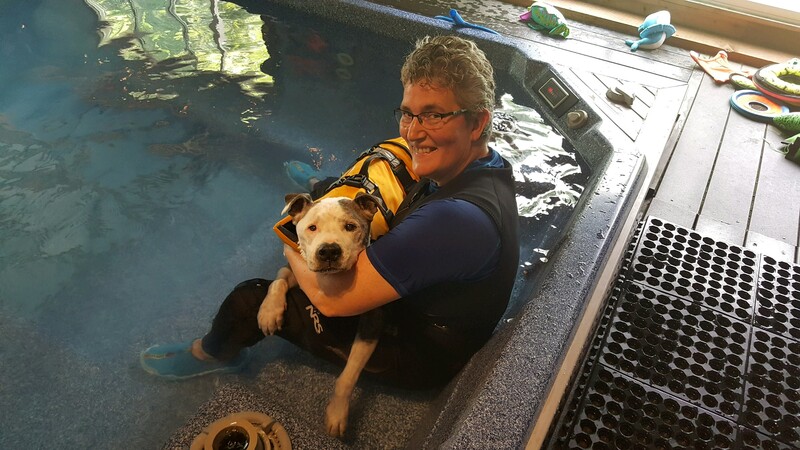 Each session of swim therapy is tailored to the dog’s specific needs — recovery from knee or back surgery, relief from arthritis due to previous injury, surgery, or age, and strength-building exercise for dogs who have lost muscle tone — under the guidance of a swim therapist. Since 2010, Gretchen has worked as a swim therapist in a variety of pools. Currently, Triple Dog Pet Therapies works out of two local pools — Aqua Dog Spa in Kent and Splash Dog Spa in Edmonds. You can book online at each site, requesting Gretchen as your massage therapist or work with one of the other amazing swim therapists — Cindy at Aqua Dog or J Linn or Leigh Anne at Splash Dog. Services are offered by Triple Dog every Sunday and every other Wednesday. You can pay via check, cash, or using our Pay Pal account — paypal.me/tripledog – at the time of service. Gretchen works as an independent contractor at Splash Dog and is on the schedule for Saturday afternoons/evenings and Monday afternoons/evenings. Pricing/Services – Please check the Splash Dog Spa pricing page for services and costs. Payment is made at time of service at the Splash Dog pool.